If a plain old Wendy house doesn’t quite do it for you, check out the luxury handmade playhouses by The Master Wishmakers. Weatherproof and with sustainably sourced wood, prices start from £5,000. Pictured is the two-storey Adventurer’s House, £54,000, which might sound steep but it does come complete with a car, aeroplane, slide, custom-made kitchen and electricity. 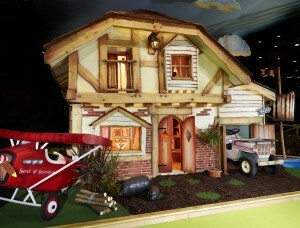 The team also operate a bespoke playhouse service too. Check out the range of playhouses here. For those with deep pockets, these Wishmakers will literally create the bedroom or playhouse of your little darling’s dreams. A hobbit hole at the bottom of your garden – easy. A Winnie the Pooh bedroom – done. They’ve even made an entire pirate island complete with lagoon and tavern. Tempting to have them kit out the whole house, frankly. Imagine waking up every morning in your very own theme park. With no queues. Shiver me timbers! This pirate island has been custom built in a lake on a millionaire’s 60-acre private estate – in the arrrrrght of Cambridgeshire. James Challis, a member of the local Dickerson family, created it in memory of his grandad, haulage and gravel extraction tycoon John. Challis Island, just five miles from Cambridge, comes complete with a pub called The Black Doubloon, Coffer’s Cabin guest house, Lubber’s Locker beach hut Dead Man’s sun deck, it’s own special seal and an 18th century-style colonial Caribbean main street. The island, not open to the public, was constructed by Kettering-based company The Master Wishmakers after the lake had become silted up. Pirate fan James said: “We hope that it will be a fitting tribute to be enjoyed by many generations to come. It looks like backdrop for Jack Sparrow to sail towards under a Caribbean sun, but this pirate island has actually been built by an eccentric millionaire on his English country estate. Situated in the middle of a lake, it includes a working pub named The Black Doubloon, a boat dock, a waterfall and a beach. Coffer Cabin contains a specially designed pirate bed. The owner has not been named but he is under 40 and is said to have been inspired by “his love of all things pirate”. He commissioned the construction of Challis Island on his 60-acre Cambridgeshire estate 18 months ago. He was said yesterday to be “over the moon” with the result and to have bought himself a pirate costume as he prepares to live like Pirates of the Caribbean, the films in which Johnny Depp plays Sparrow. The company behind the project, The Master Wishmakers, based in Northants, is more used to creating one-off playhouses and bedrooms. It drained the existing lake and employed 15 craftsmen at a cost of millions of pounds, working from the designers sketches and verbal explanations. A millionaire spent a fortune building a pirate island – in a lake miles inland. Company heir James Challis, 29, created the Pirates of the Caribbean-style hideaway as a tribute to his late grandad. The retreat in Cambridgeshire features a guest house called Coffer Cabin, The Black Doubloon tavern, Lubber’s Locker beach hut, a ‘ruin’ named Dead Man’s Deck and a dock. James built it all in memory of family firm founder John Dickerson, who wanted “something special” done with the site. What do you buy the pirate-loving multimillionaire who has everything? Their own Caribbean oasis of course. Except this 60-acre island paradise is more than 4,500miles away from the traditionally pirate-infested waters surrounding the Bahamas. Challis Island was built for a wealthy landowner who ‘loves all things pirate’. He is under 40 but wants to keep his identity private. The pirate paradise includes a fully-working pub The Black Doubloon, a guest house dubbed Coffer’s Cabin, a beach hut and a sun deck for Caribbean barbecues, which will be used by the owner and his guests. All the buildings were made from wooden oak and Douglas fir frames, with roofs made from cedar tiles or thatch for authenticity. The island was built to a height of 3m out of the lake from scratch, and includes landscape features such as a beach, stream, lagoon and waterfall. It was hand-built by The Master Wishmakers, who specialise in making wealthy clients’ dreams come true without using ‘plastic imitation theme park trickery’. View Challis Island by clicking here.